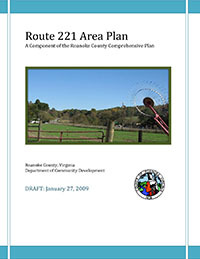 The Route 221 Area Plan was adopted by the Board of Supervisors on January 27, 2009, to protect the area’s unique resources while planning for compatible development. This Plan highlights the character of the Route 221/Back Creek Community and generates a functional plan with attainable short and long-term goals, objectives and strategies. The Route 221 Area Plan Study Area consists of approximately 5,600 acres bounded approximately by Cotton Hill Road on the east, the Blue Ridge Parkway to the south, the base of Bent Mountain to the west, and lower Twelve O'Clock Knob and Mount Chestnut to the north. View a map of the Route 221 Area Plan Study Area. Planning Staff in conjunction with the Western Virginia Water Authority held an Open House style Community Meeting on September 30, 2014 from 4:00 p.m. to 8:00 p.m. at the Back Creek Elementary School Gymnasium. This meeting was held to provide information to area citizens regarding the proposed Route 221 Area Plan amendment and the proposed Western Virginia Water Authority waterline extension. An Informational Handout was distributed to the attendees and numerous maps were displayed to provide additional information. Sixty-four citizens recorded their attendance at the open house and provided feedback to staff through comment sheets. For additional information on the Route 221 Area Plan, please contact David Holladay at (540)772-2094.